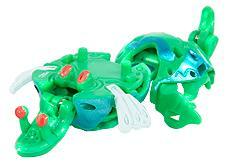 Nastix is an unreleased, snail-like Bakugan. It is in the BakuSuper G series. Nastix looks like a plant version of Wormquake. It is like a blob-like creature that staggers along on two "legs". Its Darkus version has 1000 Gs, Aquos has 1250 Gs, and Ventus has 1100 Gs. It will be released in November/December. Purchase your Nastix from Amazon now!